If at first you don't succeed try-try-try again! 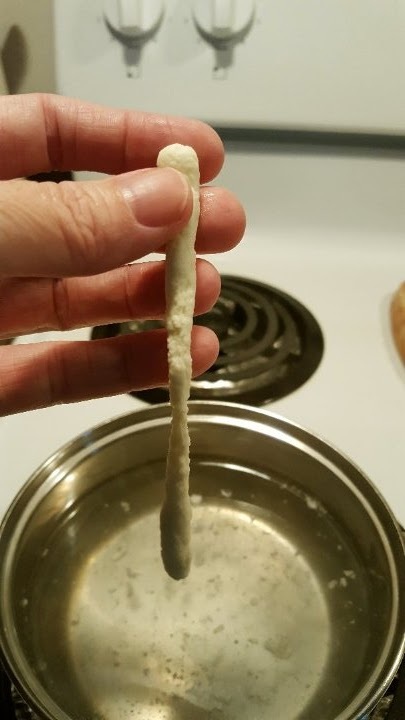 My Mozzarella just didn't stretch again. 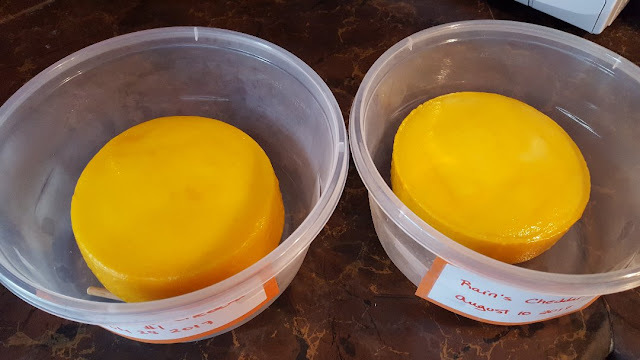 I was chatting with the author of Mastering Basic Cheesemaking and she gave me a few tips which I used this time around, but my curd still wouldn't stretch. She told me that most of the traditional recipes assume you have raw milk...which most people don't have access to. 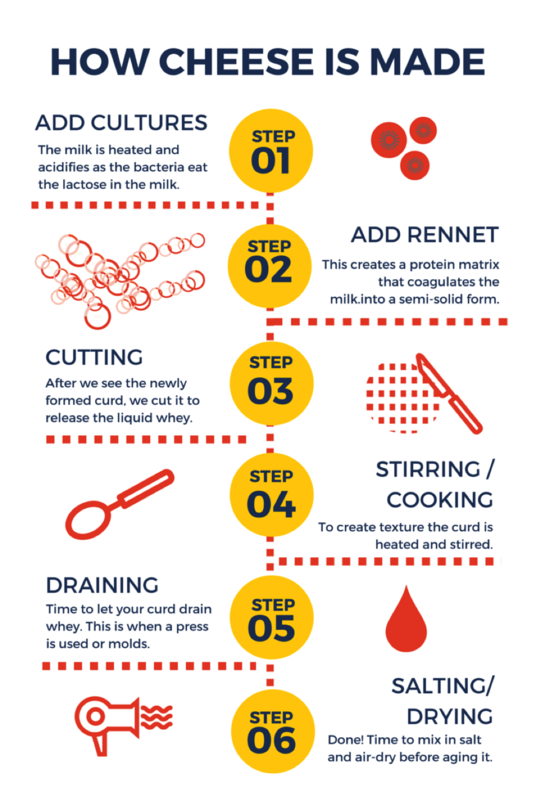 The pasteurization and homogenization of grocery store milk messes up the calcium molecules, making it difficult to form a curd. 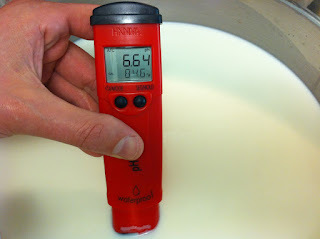 You simply add Calcium Chloride to try to solve the issues of pasteurization and homogenization to grocery store milks. That helps restore the calcium molecules to help solidify your curd, but that's just one problem solved! But then there are conflicting suggestions/opinions/advice from other experts saying to NEVER use Calcium Chloride when making Mozzarella because it'll affect the stretch. AAAACK! Who to believe??? By the way, on my first 3 attempts, I DIDN'T use Calcium Chloride, sigh, so neither way worked anyway! 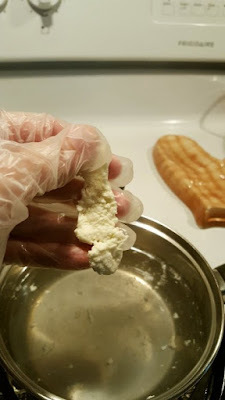 My nice Blogger/Ravelry friend Becki from Field Lilies asked me to explain why Mozzarella needs to be stretched at the end of the process to make it "successful". Just a note, when I say "failed" I can still eat the cheese. It's not wasted at all, it's just something unexpected! 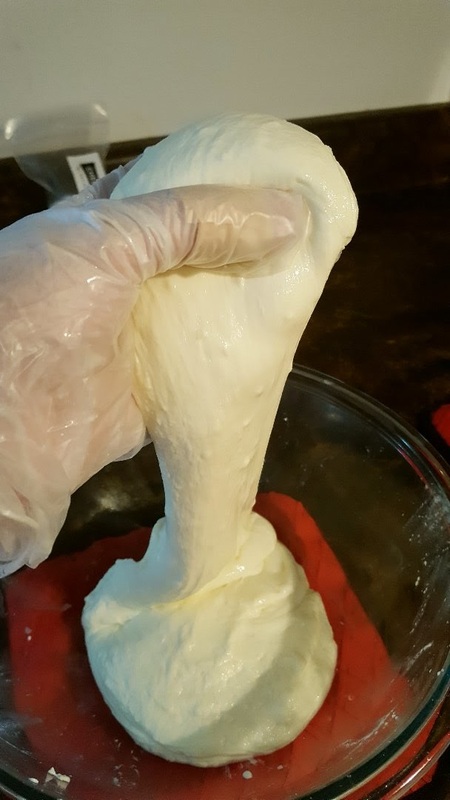 If you are able to achieve a nice stretchy Mozzarella during the cheese making process, it melts nicely when cooked. You get an even coating of cheese and a nice nut-brown colour when it's heated. When you lift it off your pizza for example, you get all the cheesy strand goodness! The texture is pleasing, it's moist and slightly springy which makes it pleasant to eat. 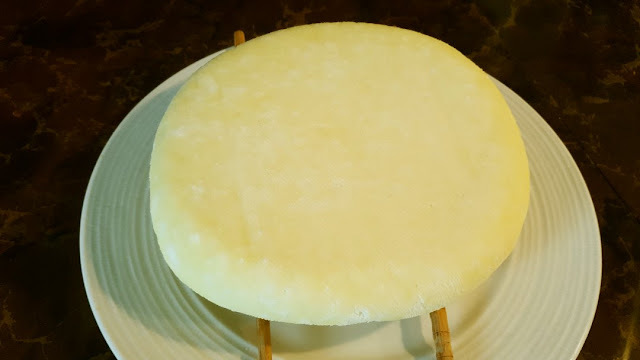 If the curd doesn’t stretch during cheese making, the consistency is very rubbery and too chewy, it takes longer to melt (if it does melt at all), browns too quickly and doesn’t have good stretch when melted on a pizza. Or it could just never form at all, becoming more of a cream cheese or ricotta style cheese. Still edible of course. What I've learned is that a successful Mozzarella relies not only on calcium molecules being consistent in the milk, it also and more importantly relies on PH levels (which stands for Power of Hydrogen). The ideal PH level for a great Mozza is 5.2. 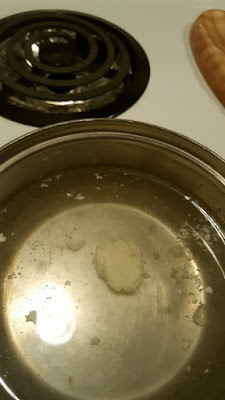 If the acidity (PH) is too low, it will simply pull and tear, but not stretch and become a cream or ricotta type cheese (I think this was my issue). 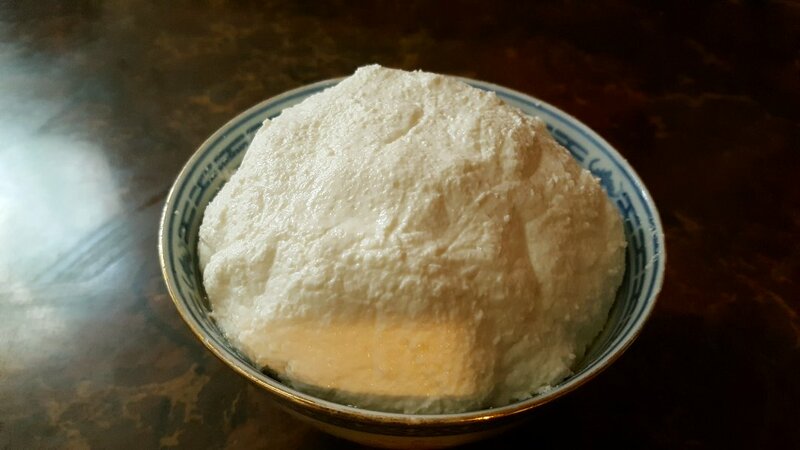 In my photos, this is my curd after 4 hours of ripening and my attempt to see if it was ready during the "stretch test" in boiling water. 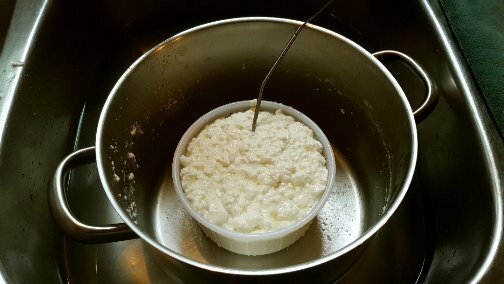 If the acidity is too high, it will be grainy and fall apart into curds (which was what happened with my attempt number 1). In the "quick" or 30-minute Mozzarella recipes, you add citric acid at a specific quantity depending on the amount of milk you use. 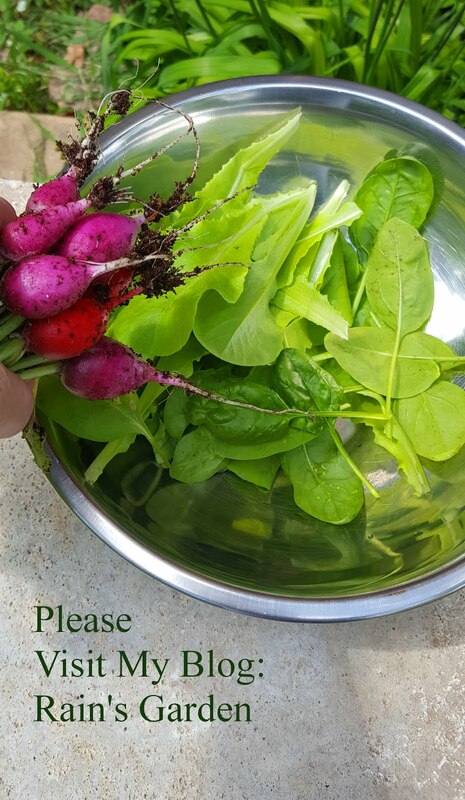 Normally speaking, this is a no fail way to get your acidity to around 5 to 5.2 so that's why the quick recipe works so well. Problem is, it's not "age-able" which is why I wanted to use the traditional method. I want to age it a little so it dries up and I can grate it for pizzas. The traditional method relies on bacterial culture (not citric acid), consistent heat and lots of time to ripen and get the proper acidity levels. This is why it's so tricky because there are so many variables. Admittedly, I didn't have high hopes this time around. But I am learning a lot. 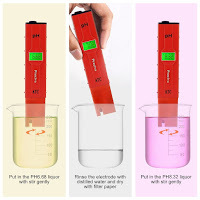 In fact, I ordered a PH meter yesterday so that I could give myself more proper tools and increase my level of success. When I get my PH meter, I'll try a fifth attempt! But I do have a nice Ricotta now. :) This is my fourth Mozza. Sigh, sigh, sigh. I should be getting the PH meter by the end of the week, so maybe next weekend I'll try another time. My little angels...:) The 3-month and 6-month Cheddars are doing really well! 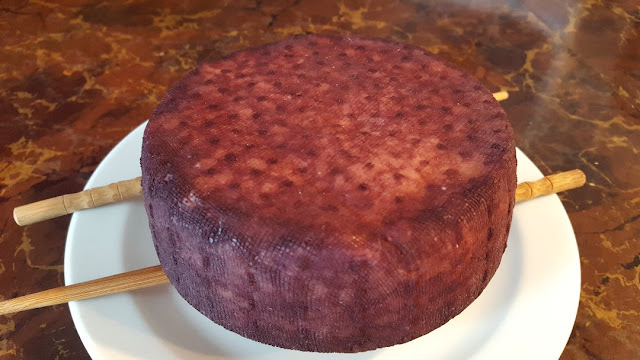 The red wine infused Cheddar I made this week is also doing well, but taking a lot longer to dry since it was soaked for 5 hours in the wine. I've moved it to the cheese cave to help it dry up some more before I wax it. My little cheese cave is getting full! I think my next dilemna will be how to fit more cheese in there...I might need to invest in a full-sized second hand fridge after all! Honestly Dianna, it's been a struggle with the traditional Mozza. I'm sure those Mozza kits are for the 30 minute version. The kits come with citric acid...which really makes a fresh-style Mozza no fail in my opinion. I've made it 3 times and each time it worked for me. You have to eat it up quick though. The Dry Jack cheese was very easy! But you do need the right equipment. But...DON'T GIVE UP THAT DREAM!! One of the books I shared with you is called "One Hour Cheese" (it's in PDF). That one has a bunch of quick cheeses that you could try. And maybe when you have more time when you're done working, you can give a Cheddar a go, or a Dry Jack. The Camembert recipe looks rather easy, but the ingredients are a bit pricey. It's an investment at first with money, but then with your time for the aging cheeses. 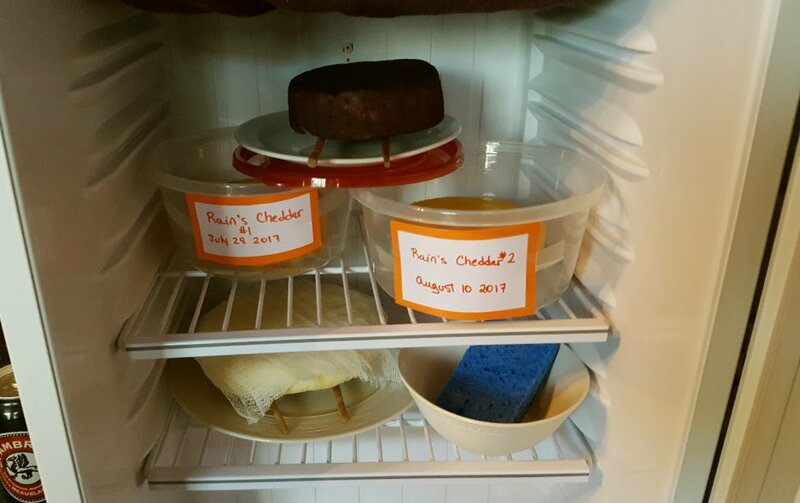 To make her one-hour cheeses, you just need a few ingredient: citric acid, rennet and maybe calcium chloride for our grocery store milks that are over processed - the calcium chloride helps form the curd, but it's always optional. Cheese salt too...maybe about a $25 investment at first and you'll have ingredients for dozens of cheeses. The cheese cave! You gotta love that :) Hey, getting ricotta cheese as an error is a pretty darned nice mistake. LOL Onwards and upwards, as they say. You are doing great and learning a whole bunch of things along the way. So am I from your blog. 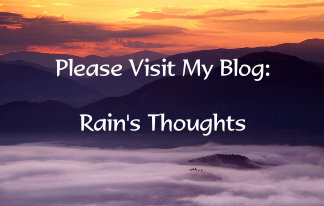 Wow - I learned so much reading this post, Rain! Not that I imagine ever using it (I don't picture myself making cheese - ever), but it was fascinating all the same. Small note: I had no idea what the P and the H stood for in PH, and never was even curious enough to look it up, evidently. Okay... so non-stretchy, or grainy Mozzarella is essentially Ricotta (or can be used as a Ricotta substitute?) Mmmmm... Bring on the lasagna! Hi Martha :)) Yes, ricotta as an error isn't too bad :) Except when you're expecting to make a pizza with it lol! And thank you, I really am in a position of learning out of desperation because I really thought it would be simpler!! Hi Becki :)) I'm glad you liked the post :) You're right, when life gives you ricotta, you make lasagna lol! Non-stretchy Mozza is ricotta (in my case) because the PH was too low. If the PH is too high, non-stretchy Mozza is a very rubbery, suitable to substitute a puck for hockey games. :) PH Meter is arriving tomorrow so fingers crossed! And please, keep with the constant amazement lol, I love knowing that something I'm writing is interesting!!! I admire your persistence, Rain! I'm sure your cheeses will taste wonderful. Cheese is one of my most favorite edibles ~ right up there with chocolate and red wine! How cool to have a "cheese cave!"